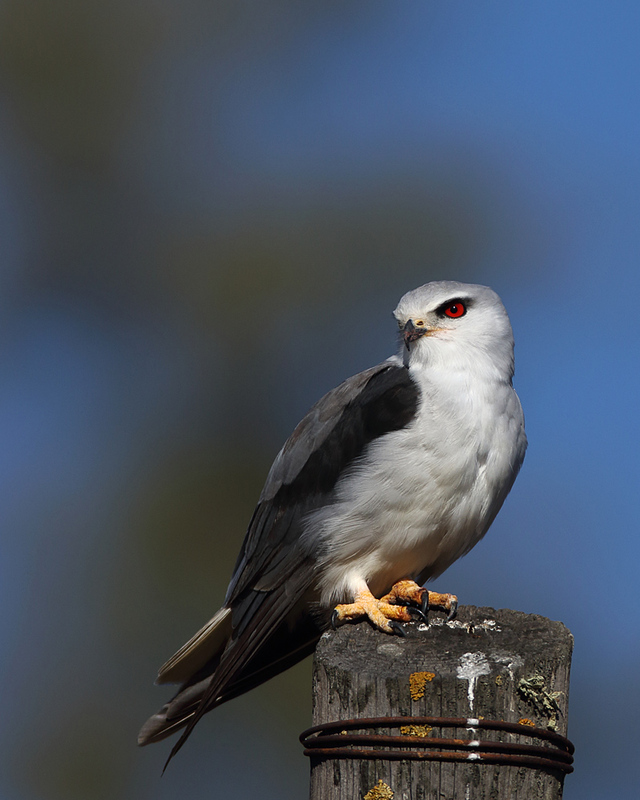 Black-shouldered kite is one of the most sought-after birds on the European continent, only present in a small population in Spain and Eastern Portugal. In parts of South Africa it is the most frequently viewed raptor, along with the steppe buzzard. This image was shot in the early evening. EOS 7D mkii with 600mm, f4.5, ISO 100, 1/2500sec. Underexposed 0.7 of a stop. I travelled to South Africa for the Porterville paragliding Open in December, and got a few chances to test my “new” Canon EF 600mm L f4 IS USM and the new EOS 7D mkii as well. As usual, South Africa is a great birding destination, with the river lagoon at Hermanus, the Cape Gannets at Lambert’s Bay and the general shorebirds at Scarborough (Cape Peninsula) being this trips’ highlights. The lens is nothing short of amazing – I love everything about it except the weight… The camera is good in many respects, not least the AF and the light metering, and obviously the speed. The latter leads to very many frames being taken, surely a good thing but a pain in the arse when sorting through the images later. I tried shooting with the TC 1.4x mkii on the 600mm; lots of reach, but pretty poor IQ so far (before micro adjust). The following images are essentially snapshots from the trip, since no real serious bird photography sessions were had. But some are pretty nice all the same. Remember to click on one of the images to call up the full-size gallery, and consider hitting f11 to get the full-screen experience. A cape gannet flying in to land at the colony on Bird Island, Lambert’s Bay. EOS 7D mkii with EF 300mm f4 and TC1.4x mkii. ISO 200, f7.1, 1/640sec, underexposed by 1/3 stop. I wanted to come home with images showing the bird density in the Lambert’s Bay colony – this one accomplishes that, if I may say so. Another spot landing expert coming in. I like the background in this one. Great crested terns from the colony at Bird Island, Lambert’s Bay. EOS 7D mkii with 600mm. ISO 125, f7.1, 1/800sec. Underexposed 0.7 of a stop. White-fronted plovers are found in very many locations. These were photographed using the EOS 7D mkii with the 600mm lens at the Hermanus river lagoon. ISO 100, f6.3, 1/800sec and underexposed 0.7 stop. One more white-fronted plover giving the photographer a good checking out. Another white-fronted plover from Hermanus. Brown snake eagle with pied crows. The snake eagle had just finished eating the rear half of what I believe was a cape cobra, and the crows wanted the other half. Not sure what the purpose of the formation flying was. EOS 7D mkii with 600mm and 1.4tc, ISO 200, f6.3, 1/1250sec, underexposed 1 stop. The blacksmith plover is a common bird on inland lakes in the Western Cape. EOS 7D mkii with EF 600mm and TC 1.4x. ISO400, f7.1, 1/1000sec and underexposed by 0.7step. This shot is of the same bird as in the previous frame, but taken around 1h earlier. The position is better except for the grass in the background, but the light isn’t as nice. The Reed Cormorant is much smaller than our local shags, and has a fancy red eye. This one is busy preening face with flipper/foot. EOS 7D with EF 600mm. Live fish aren’t easy to swallow. The Cape Sugarbird even looks a bit like a hummingbird, but it is much larger – some 30-40cm from tip of tail to tip of bill. Notice the flower pollen on the forehead. The African black oystercatcher is larger than the NZ version but otherwise VERY similar. Photographed at Hermanus.